LI-CAN and its partners, Visiting Nurse Service of NY and Partners in Care, leveraged a grant from the NY state Department of Transportation to subsidize transportation for home health care workers on Long Island. Through this partnership, Partners in Care expanded its home health workforce on Long Island and its subsidies to aides caring for seniors and the disabled. Partners in Care also opened its new training and recruitment center in Hicksville in order to meet the needs of this rapidly growing population. Following superstorm Sandy, LI-CAN organized its members to demand transparency and accountability in the state's decisions about future energy provision on Long Island. LI-CAN leaders convened a bi-partisan group of state legislators to promote our five pillars for quality electrical service on Long Island. These efforts were highlighted in our oped and quotes in Newsday and on NPR and local radio during 2013. LI-CAN's pressure resulted in Governor Cuomo holding two public hearings on the issue, one in Nassau and one in Suffolk, giving LI-CAN leaders and other residents an opportunity to provide testimony and feedback on the Governor's proposal. LI-CAN launched a partnership with Partners in Care, the Visiting Nurse Service of New York, and the Town of North Hempstead to improve and expand home health care for seniors and create quality jobs, training and low-cost travel for home health aides. In May 2009, LI-CAN achieved a first victory in its Jobs for Youth Campaign. 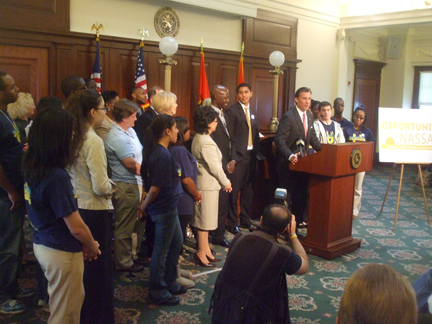 On May 28, Nassau County Executive Tom Suozzi joined with 60 LI-CAN leaders to launch the Nassau County Youth Employment Corps. This new initiative brought together all available youth employment resources in the county, including $1.6 million in federal stimulus dollars, to provide summer opportunities for 1,000 low-income and marginalized youth in 2009. At the press conference, County Executive Suozzi gave LI-CAN credit for making this issue a priority. 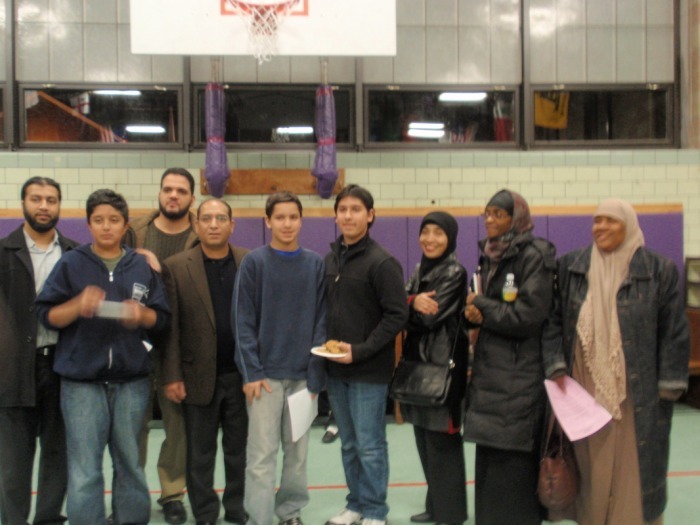 In July 2008, 300 members of St. Brigid’s RC Church, a LI-CAN member, turned out to a hearing of the Westbury Village Board of Appeals to say “Yes in Our Backyard” to a proposal to rent the parish convent building to a new state-funded school for autistic teenagers. The board voted unanimously in favor. In 2007, then-Governor Eliot Spitzer added $26.6 million to the state budget in new capital funding for 100 beds of high quality residential treatment in Nassau and Suffolk County, a major victory in LI-CAN’s Better Sober Housing Campaign. Beginning in 2004, leaders of the LI-CAN Health Care Campaign documented serious problems in the six Community Health Centers affiliated with the Nassau Health Care Corporation (NHCC), including: excessive wait times for appointments, clinics being closed during normal operating hours, insufficient staff, and billing problems. The team met with over 130 health clinic users, visited several of the clinics and researched high quality community health practices in other counties. Throughout 2004 and 2005 the team met numerous times with county officials to push for reforms. In September 2006, County Executive Thomas Suozzi and Arthur Gianelli, the president of NHCC, announced a 5-point plan to overhaul the clinics, addressing every one of the issues that LI-CAN leaders had raised. In response to LI-CAN’s Better Sober Housing Campaign, in February 2006 the New York State Office of Alcoholism and Substance Abuse (OASAS) closed a second scofflaw provider of outpatient treatment and sober housing, Crossings Recovery Systems. OASAS cited Crossings for numerous regulatory violations, fined the agency $6.9 million, and revoked its operating license. In July 2005, in the first of several major victories of LI-CAN’s Better Sober Housing Campaign, the New York State Office of Alcoholism and Substance Abuse Services closed down Lake Grove Treatment Centers, one of the largest and most abusive providers of outpatient treatment and sober housing. At the time of their closing, Lake Grove owned or operated 42 sober homes in Suffolk County. After a thorough investigation, OASAS revoked Lake Grove’s operating certificate for its outpatient treatment center, fined the agency $1.5 million, and closed down its homes, transferring the clients to more appropriate treatment and housing services. In March 2004, 45 leaders of LI-CAN’s Better Sober Housing Campaign gathered with Senator Charles Schumer to bring attention to the terrible conditions in Long Island sober houses and to call on the U.S. Department of Health and Human Services to launch an investigation. Built a constituency to change Nassau County’s inequitable and racially discriminatory property assessments, pressing county officials to hold public hearings and adopt new assessment practices. Defeated the proposed closing of public health clinics in Suffolk County. Held citizenship classes for more than 400 potential U.S. citizens from 30 countries, preparing them for active roles in their communities. Stopped the closing of the heavily-used Immigration and Naturalization Service office in Nassau County. Won a prompt state-federal clean-up of the Liberty Industrial Finishing Corp. toxic waste site in Brentwood. Won commitments from key officials negotiating the sale of the Nassau County Medical Center and health clinics that these facilities would continue to serve uninsured residents. Challenged predatory mortgage lending and real-estate practices in Suffolk County, winning cancellation of $1.3 million in fraudulent mortgages from developer-swindler Douglas Rotondi, better building code enforcement in the Town of Babylon, and home repairs from another developer, Morway Development Corp. Recruited potential African-American and Latino police officers in Suffolk County, where the county police department was only 2% African-American, and won commitments from the police department to study the hiring process to identify barriers to the hiring of minority officers. Organized a prep class conducted by John Jay College to help potential officers prepare for the police civil service exam. Won numerous local improvements in pedestrian safety, road paving, neighborhood clean-up, code enforcement, etc.